A rocket last week. A butterfly this week. 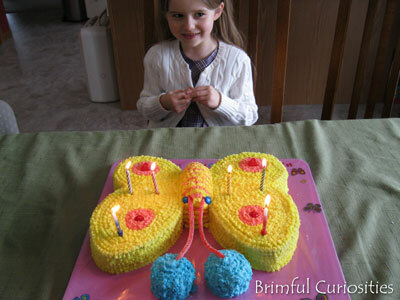 My daughter requested a yellow and pink butterfly cake for her birthday, and Grandma made her dreams come true with this cheery cake. How lovely and what a very nice, talented Grandma you have! That looks great!! So creative! That is a beautiful cake! It reminds me of the rabbit cake my mother made for my fourth birthday. Unfortunately, I refused to eat it, because I thought it was a real rabbit! That is a beautiful cake and I LOVE the pictures! Wow, another amazing effort by your mom! I think this one even beats out the rocket! I bet she does the most fantastic wedding cakes, or could if she wanted to! @rhapsodyinbooks My grandmother made several wedding cakes for friends when she was younger. My mom apparently learned a lot from her! That is a beautiful cake! Happy Birthday to her! What a fabulous birthday cake! Good Job! Her grandma did a wonderful job on the cake. Very pretty. That is sooo cute! My daughter is turning 3 in two months and I've been thinking about what kind of cake I'm going to make. 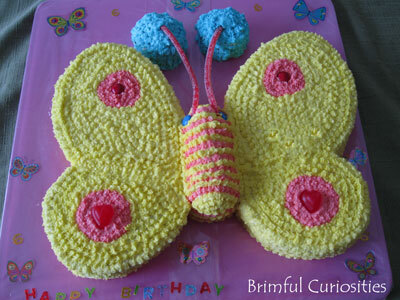 I love this cake, so cute!